Aizu-komagatake is a spendid series of rolling green hills and tranquil marshlands, with magnificent panoramic views and an abundance of wildflowers. The hike: From the bus stop, head up the paved forest road across the street. There’ll be a large white sign indicating 会津駒登山口, as well as a toilet. Hike up the paved road for about 20 minutes until reaching the trailhead proper (you can’t miss the wooden staircase leading into the forest). The trail wastes no time in gaining altitude, and if you’re hiking in April or May then the entire trail will be covered in snow. Even in the snow, the trail is very clearly marked with red ribbons tied to the trees. After about 90 minutes of climbing, you’ll reach a natural mineral spring, which apparently has really great water. It’ll be buried and impossible to find if you’re hiking before the rainy season. Fill up your bottles here, because the hut at the top doesn’t have any water. Keep climbing up and up through the dense forest until it starts to thin out. The summit ridge should start to come into view on your right, as well as nice views out to Mt. Hiuchi toward the left. Eventually you’ll reach the ridgeline, where you’ll find Komanogoya (駒ノ小屋) a small but nice hut. It costs 3000 yen to stay here and it’s run by a lovely husband and wife team who used to work at the Yari-ga-take hut in the Kita Alps. There are no meals served, but they do have futon, so bring your stove and food. There’s no water, but you can melt snow if you’re hiking before July. From the hut, turn right and continue up the path to the true summit, marked by a very tall signpost. It’s hard to believe, but this signpost gets completely buried under snow in the winter! After taking in the views, consider a side trip out to Chuumon-dake (中門岳), where you’ll find a scenic lake and loads of wildflowers. Retrace your steps back to the hut, and either return down the same way you came, or traverse the entire ridge down to Mi-ike (御池), the starting point of the Mt. Hiuchi (燧岳) climb. This traverse should not be attempted before the rainy season due to the snow crevices and the fact that there are no markings to help guide you through the snow. When to go: This hike can be done from Golden Week to early November. A winter hike is also possible if you’re prepared for the massive amount of snow. I hiked in Golden Week and there was still over 2 meters of snow remaining. There are a few minshuku just a short distance from the trailhead, where I recommend staying so you can get a fresh, early start and can also try out the local delicacy: deep-fried salamander. Access: From Asakusa station in Tokyo, take a limited express train on the Tobu Line (東武) bound for Kinukawa-Onsen (鬼怒川温泉). From there, change to a local train and get off at Aizukogen-ozeguchi (会津高原尾瀬口) station. If you want to save money, you can take a kaisoku train from Asakusa, but it will take much longer. From Aizukogen-ozeguchi station, take an Aizu bus bound for Hinoemata (檜枝岐) and get off at Komagatake-tozanguchi (駒ヶ岳登山口). There are at least 4 buses a day, departing at 9:30am, 10:50am, 12:30pm and 3:00pm, with more during the summer hiking season. If you take the limited express at noon, you’ll arrive just in time to make the 3pm bus. The bus takes about an hour and 20 minutes to reach the trailhead and costs 2200 yen. Click here for the bus schedule. Level of difficulty: 3 out of 5 (elevation change 1203m). This entry was posted on May 7, 2008 at 10:26 pm and is filed under Archive. You can subscribe via RSS 2.0 feed to this post's comments. Are you able to identify the distance and time (in Japanese hiking map speak) involved in the ‘traverse the entire ridge down to Mi-ike’ option that you identify above? 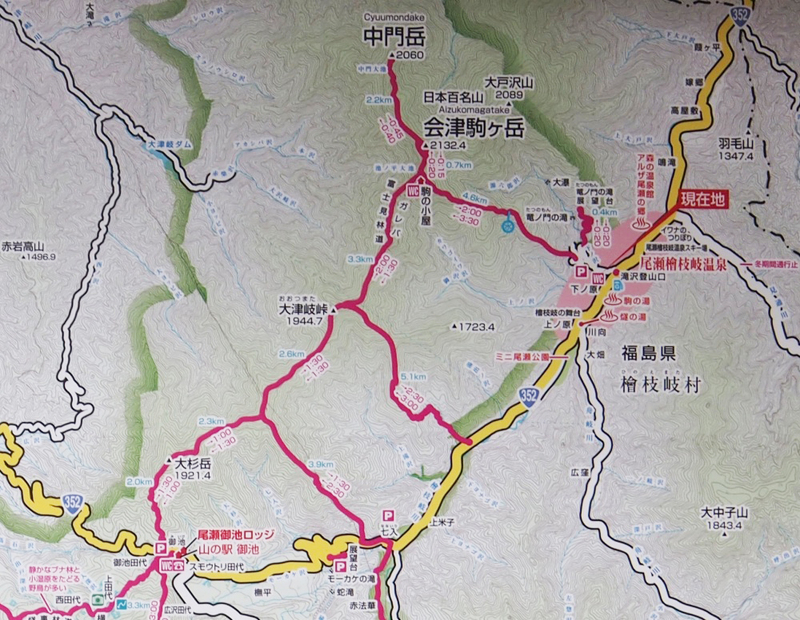 My map says 5-1/2 hours from the hut near the summit of Aizu-koma to Miike. It’s about 10.5km along a rolling ridge on a trail that is rarely used.